This lesson will give an overview of the IFSP Dashboard Widget. 1. Shows the site from which the widget is pulling data from. To change the site use the up/down arrow keys. 2. Shows Initial IFSPs that are open and open/overdue. 3. 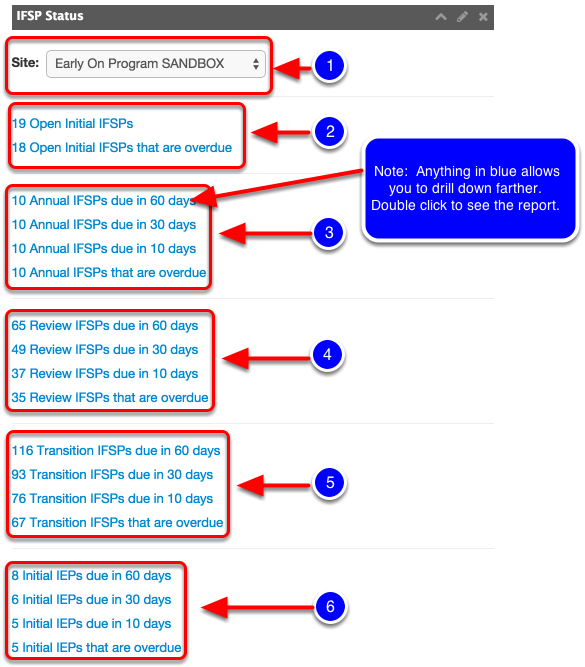 Shows Annual IFSPs that are coming due in 60 days, 30 days, 10 days and that are overdue. 4. Shows IFSP Reviews that are coming due in 60 days, 30 days, 10 days and that are overdue. 5. Shows Transitions that are coming due in 60 days, 30 days, 10 days and that are overdue. 6. Shows Initial IEPs that are coming due in 60 days, 30 days 10 days and that are overdue for those students who are Early On and Michigan Mandatory Special Education eligible ONLY. 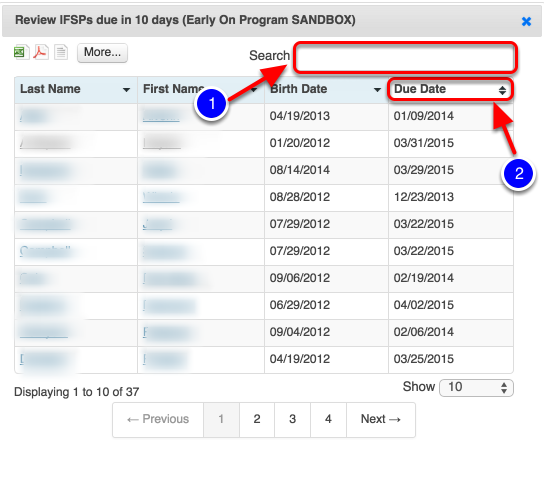 NOTE: The IFSPs due in 60 days contains all of the overdue, 10 days & 30 days in addition to those between 30 and 60 days. I.E. If a student has an overdue IFSP s/he will show up on the overdue, 10 days, 30 days and 60 days table. 1. Search by student name. 2. Due date for the IFSP Review. Note: Students will stay on this widget until an IFSP Review (not a Six Month) has been published in Illuminate.